Forget the sprouts and leave the stuffing in the fridge, because Ben & Jerry’s Soho Scoop Shop is your one stop shop for winter wonders this December. Fall in love at first bite with Ben & Jerry’s all new seasonal menu, landing in store on Saturday 1st December. The Cosy Caramel – Salted Caramel Hot Chocolate (made with Double Caramel Brownie ice cream), servied in a chocolate dipped cup, topped off with whipped cream and festive sprinkles. o The Glitz-Wich – Ben & Jerry’s ice cream nestled between soft and chewy Luminary Bakery chocolate orange cookies, topped with edible gold glitter! o The Snow Dude– the coolest take on an ice cream cake – layers of your two favourite Fairtrade flavours packed on a fudgey brownie base and topped off with a whipped cream frosting bobble hat and cone-nose. This one serves 8-10 so become the Christmas Party hero, and take this one to go. And it’s not just tastebud temptations you can find in store, from 1st December you can also pick up the perfect gift for the ice cream lover in your life (even if that’s you!) 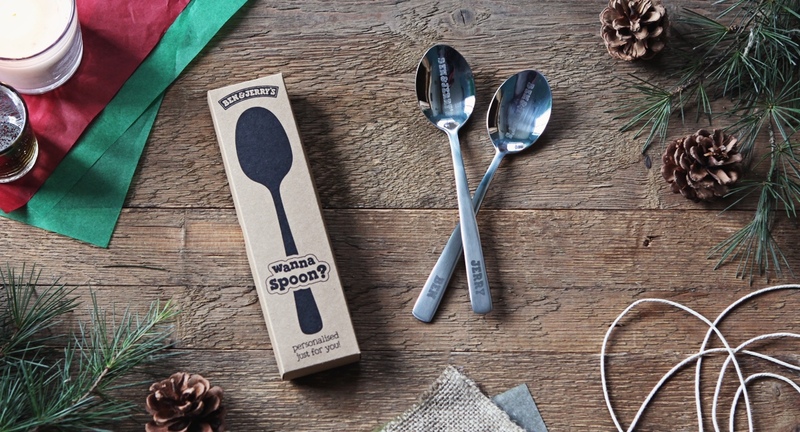 – with a Ben & Jerry’s engraved spoon. Whether it’s your name, a loving message or just something a bit silly – the Ben & Jerry’s Scooper Stars will get to work personalising your prezzie whilst you wait, before presenting it in a gift box ready for spooning.